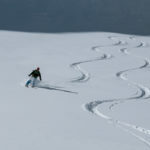 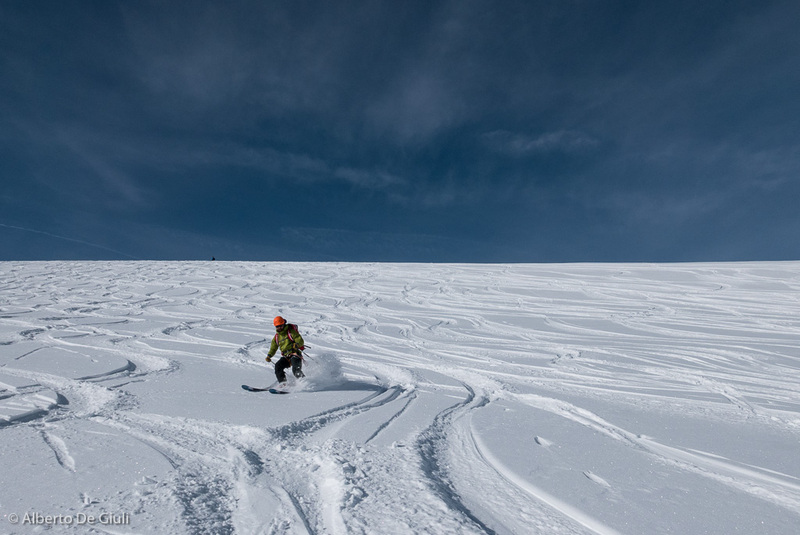 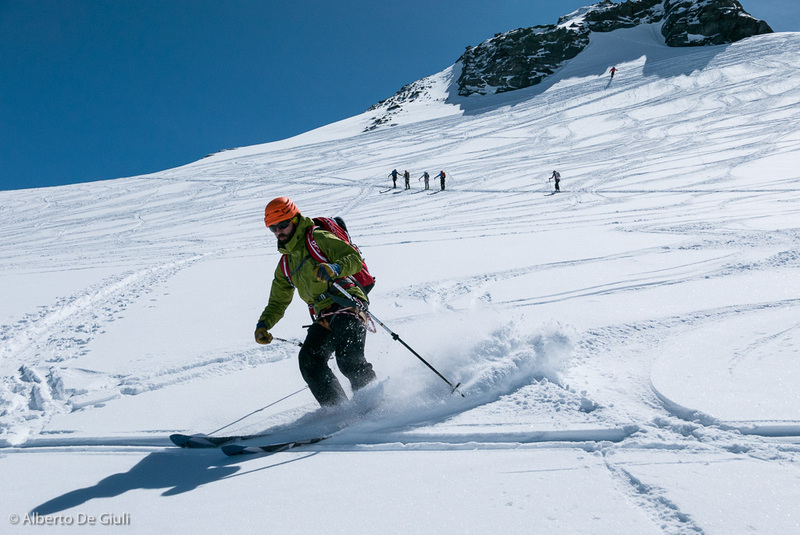 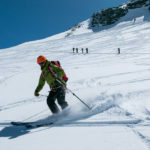 Ski the Haute Route from Chamonix to Zermatt. 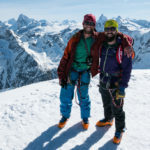 Pictures and trip report. 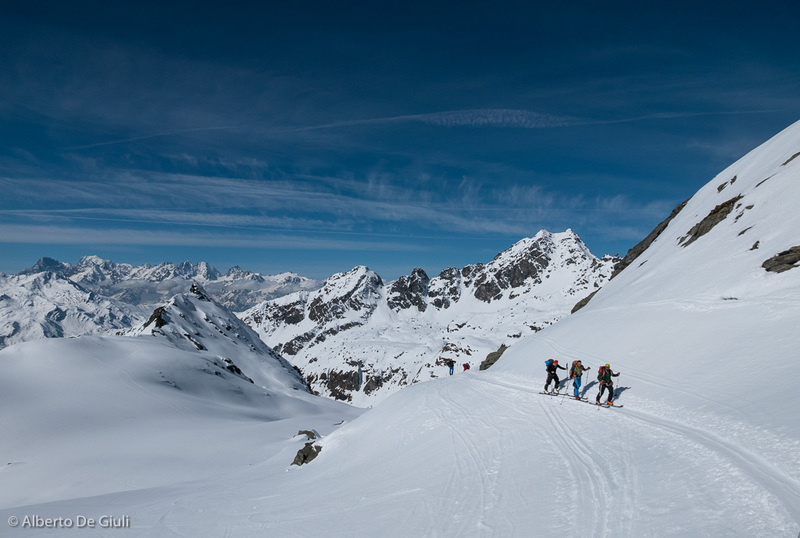 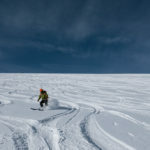 Skiing the Haute Route from Chamonix to Zermatt. 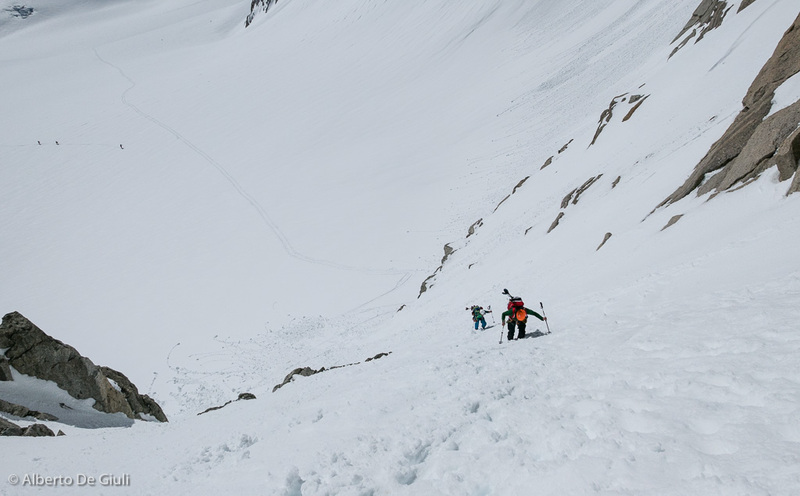 Pictures and GPS tracks. 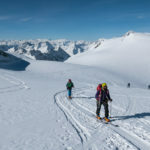 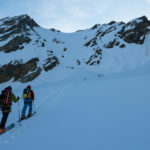 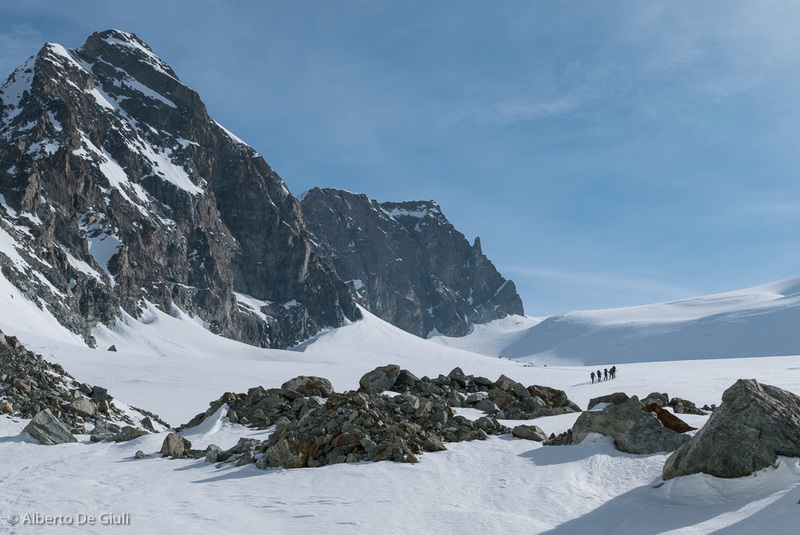 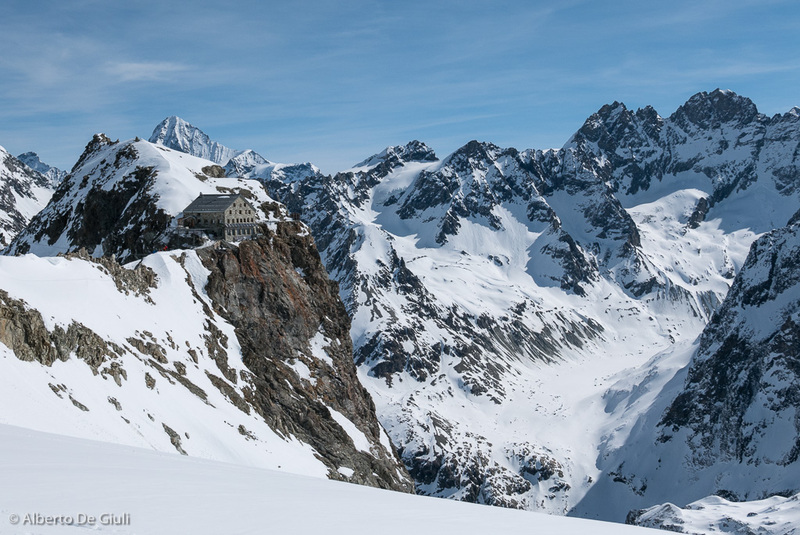 The Haute Route is probably the most famous hut to hut trip on skis all over the world and it goes across glaciers and high mountains in the Alps. 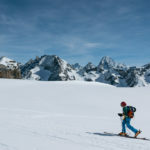 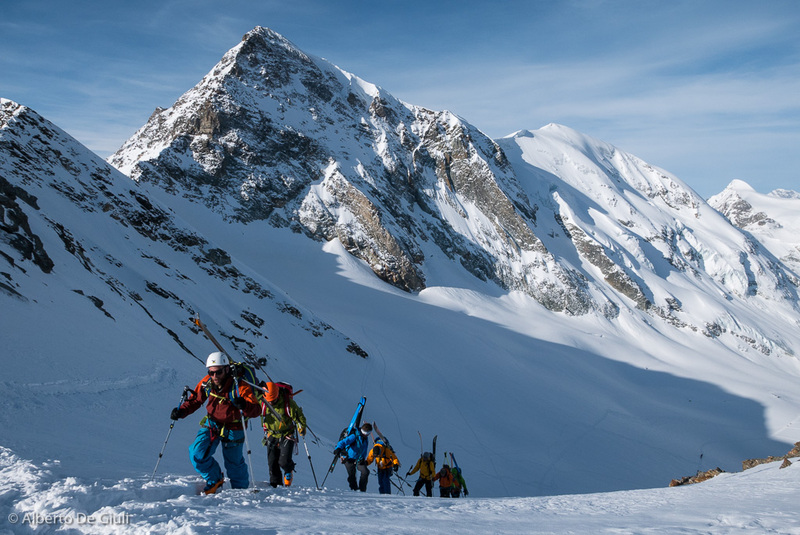 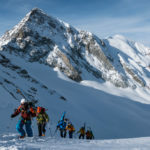 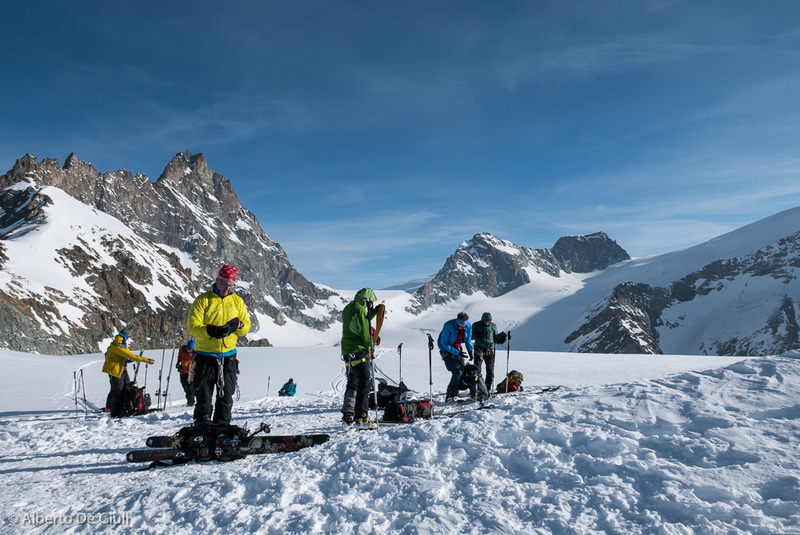 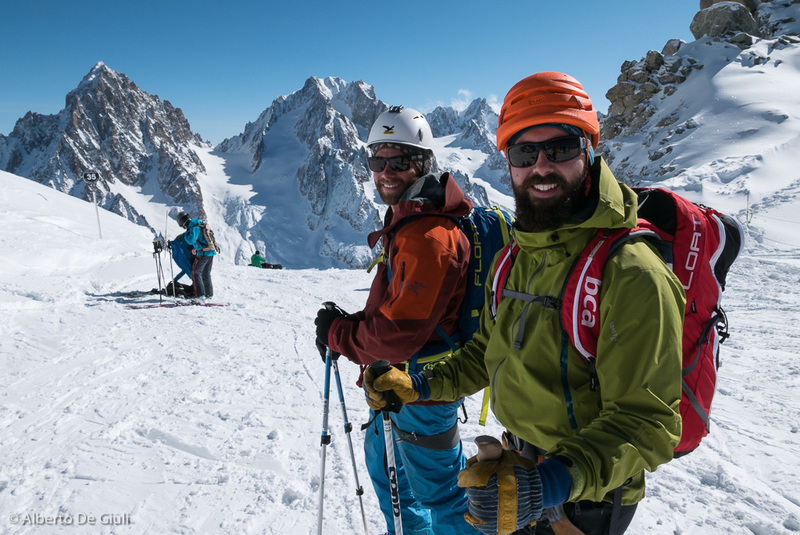 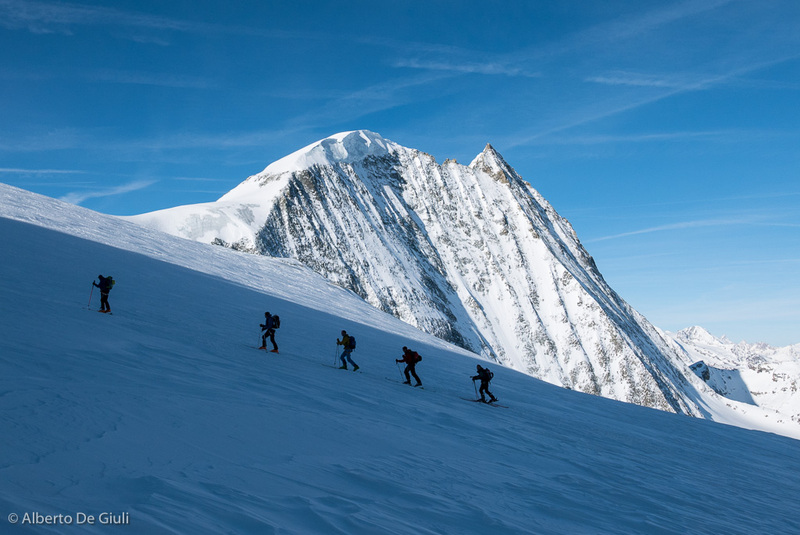 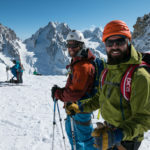 When you talk about the Haute Route, anyone who’s passionate about skis and mountains understands what we’re talking about, and lots of people from all around the world reach Chamonix every spring for this adventure with skis on their feet. 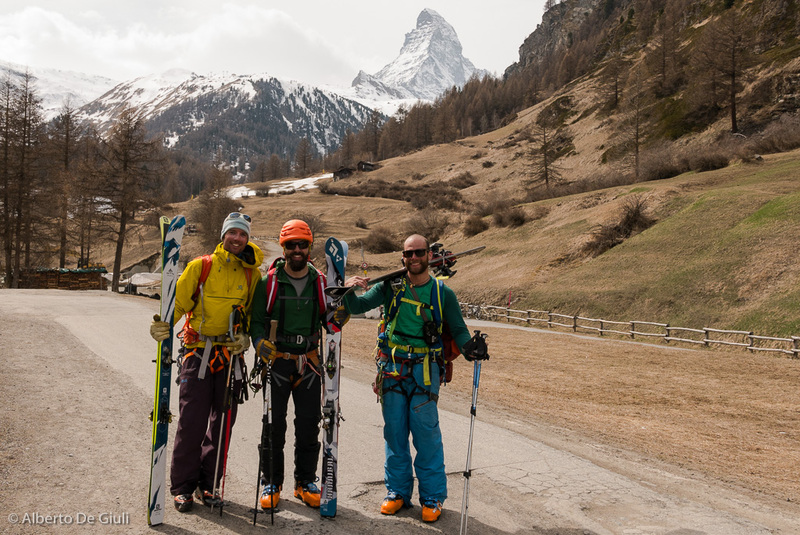 Late this March, together with Auston and Andrew from Alaska, we took six days to traverse the Western Alps from from Chamonix to Zermatt. 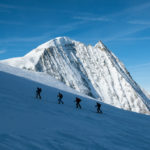 The Haute Route is a trip that you plan well in advance, we booked all the huts already before Christmas to make sure we had a place to stay, and probably we booked also the good weather. 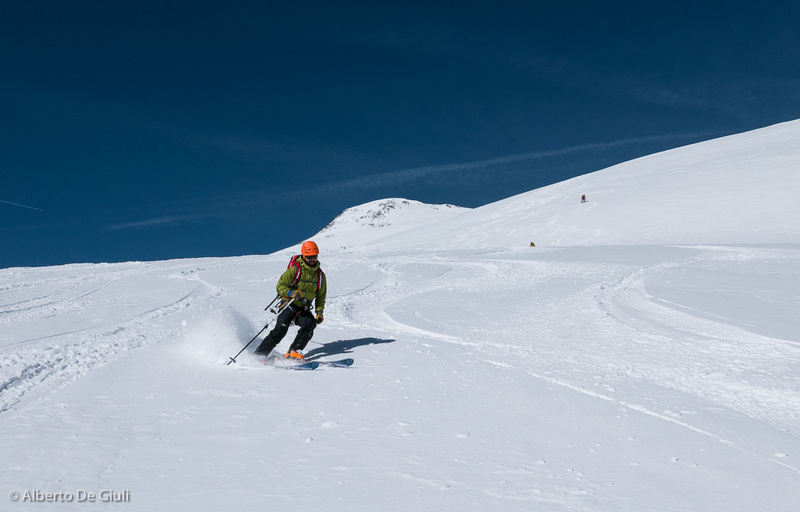 For those six days we barely saw a cloud in the sky, sun and great temperatures made our trip so much enjoyable. 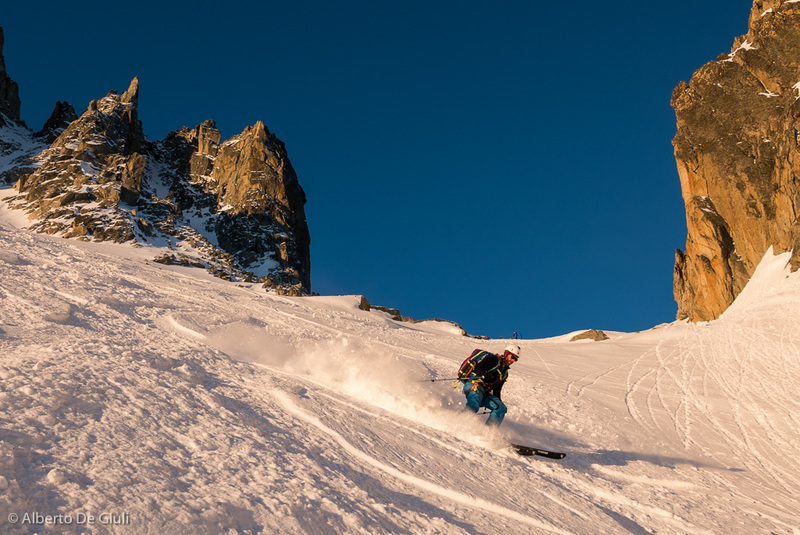 Plus, if I tell you that we found perfect conditions too, with soft snow on the north aspects and perfect corn by the sun…well, we definitely hit the spot. Powder snow down the Glacier des Améthystes. 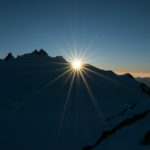 Haute Route Chamonix Zermatt, day1. 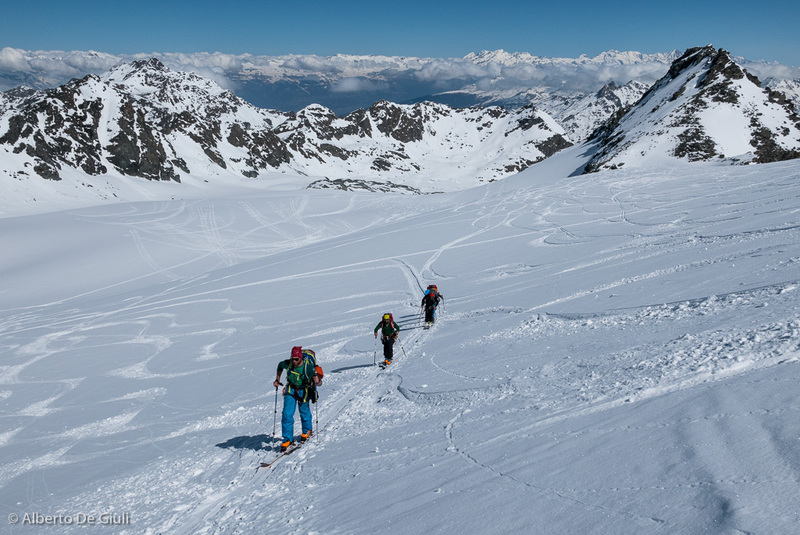 We did the Classic Houte Route via Verbier, and that’s the itinerary most of the groups follow. 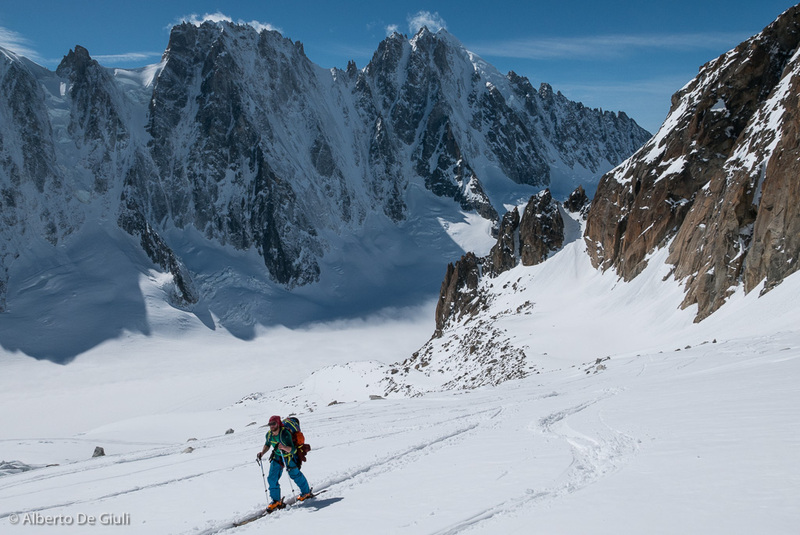 We spent the first three days around the Mont Blanc range, day 1 was a warm up on the Glacier des Amethystes before reaching the Refuge d’Argentiere for the night. 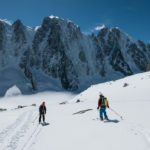 Going across the Col du Passon on day 2 of the Haute Route has been the classic route followed by most groups in the last years, and we went across the more technical Col du Chardonnet being only in 3 persons. 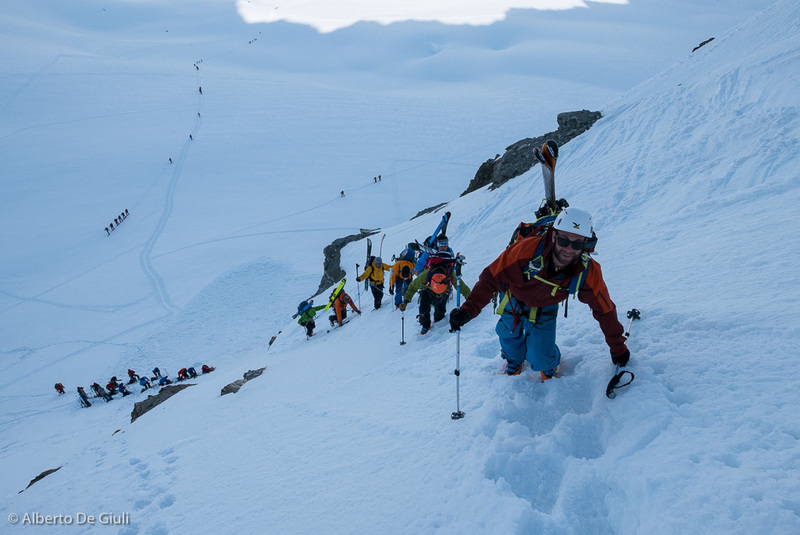 Dropping down the steep and narrow couloir to reach the Glacier of Saleina was quick thanks to a 50m fixed rope, and we didn’t have to wait long as there was just one group ahead of us. 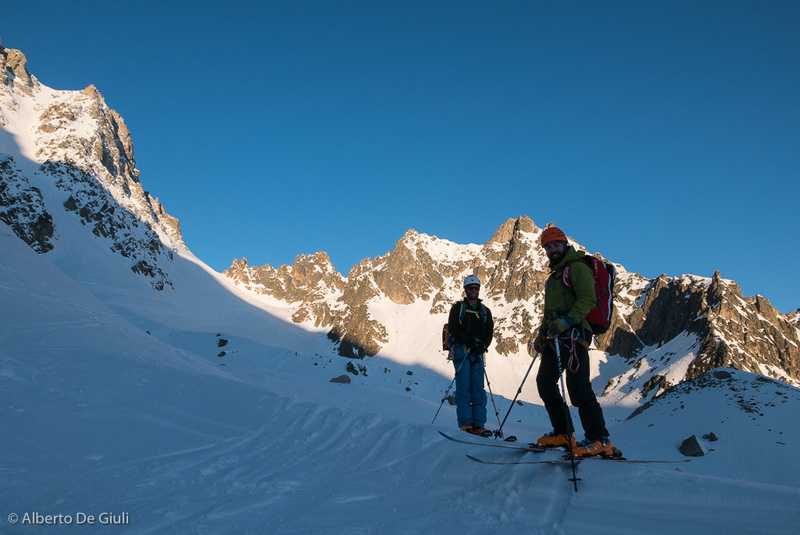 We then continued skinning to the Fenetre de Saleina before dropping down the Plateau du Trient and ending our day with a last half hour skinning to the Cabane du Trient, our hut for the night. 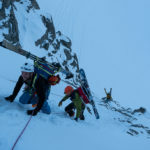 Col du Chardonnet, Haute Route Chamonix Zermatt day2. 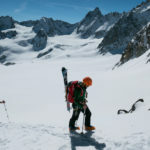 Day 3 started with a nice run down the Glacier du Trient before climbing up to the Col des Ecandies (again, a fixed rope helps the steep climb on hard snow and dry rocks), the long descent down the Val d’Arpette was good on the upper part with powder snow but still frozen down low, anyway we made it to the taxi transfer to Verbier still with the fillings on our teeth. 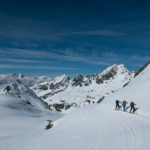 On day 3 you also leave the Mont Blanc group to get into Valais Alps, the mountains as well as the altituide you ski into are more gentle and less dramatic for this and the next day. 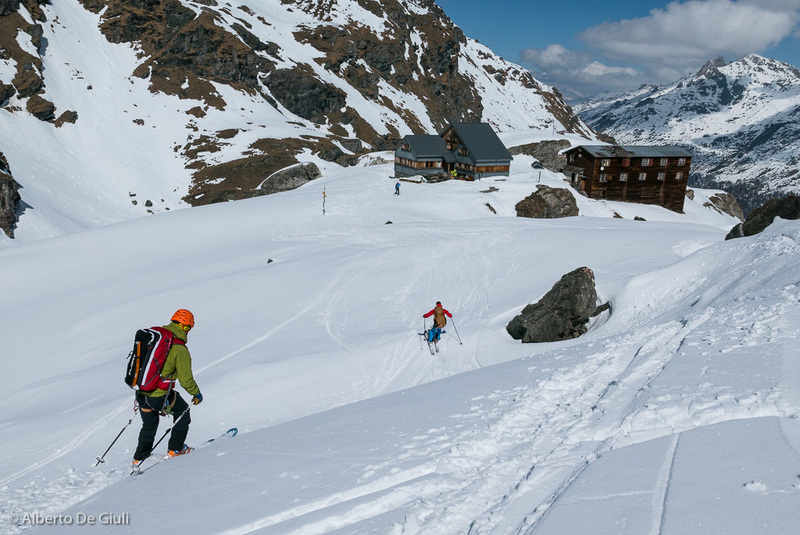 We skinned across two cols to summit the first peak of the Haute Route, the Rosablanche, 3340m , and we enjoyed a beautiful powder run down the Cabane Prafleuri, a nice little hut near the Lac des Dix. 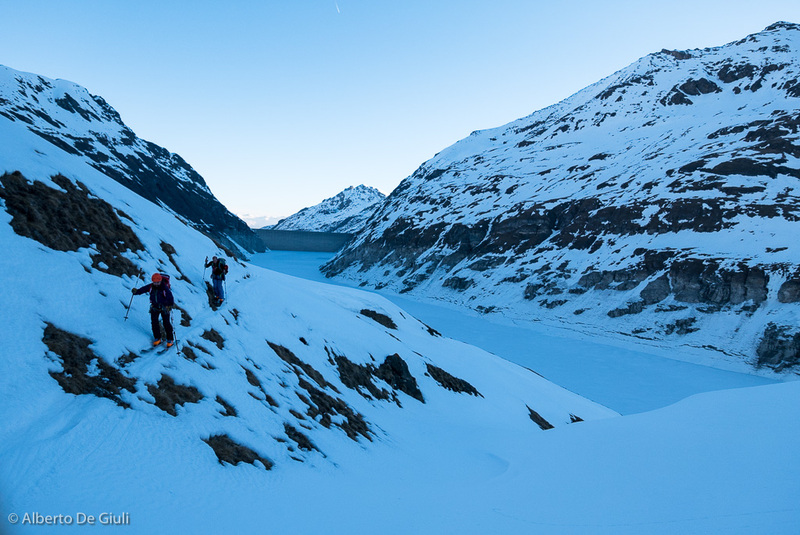 Day 4 could be considered the less plesant day of the trip, the day starts with a short uphill skinning in order to negotiate a long and exposed traverse where you go across old avalanches, you pull and skate ski over the lake until you reach the Pas du Chat, where you put the skins and start climbing towards the Cabane des Dix. 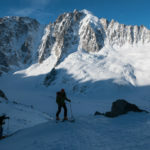 Once you reach the Glacier du Cheillon the view of Mont Blanc du Cheillon and the Passage de la Serpentine then the scenery gets amazing, and as we reached the Cabane des Dix we enjoyed the view from the terrace with a cold beer and the best Rosti Complet of the Haute Route. 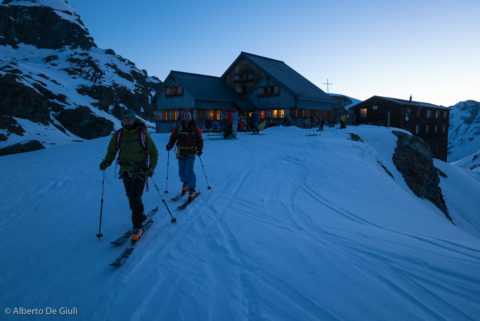 On day 4 we left the Cabane Prafleuri at the first light to climb up the Col des Roux. 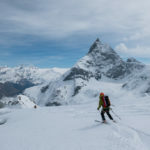 Haute Route Chamonix to Zermatt. 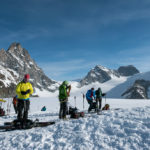 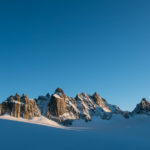 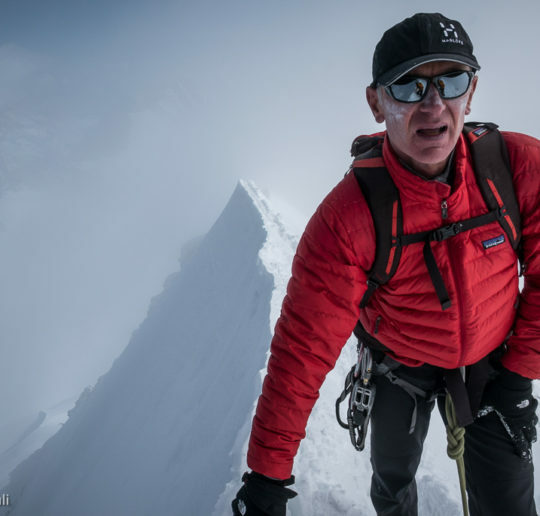 Day 5 includes one of the highlights of the Chamonix-Zermatt, as you skin to the top of the Pigne d’Arolla, 3790 meters (the highest peak of the Haute Route) going across the spectacular passage de la Serpetine where you are surronded by seracs and a pretty dramatic high mountain scenery. 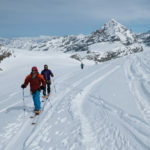 We managed to climb the steep slope leading to Col du Brenay with skis and ski crampons on our feet, and we reached the summit of the Pigne d’Arolla in less than 3 hours from the Dix Hut. 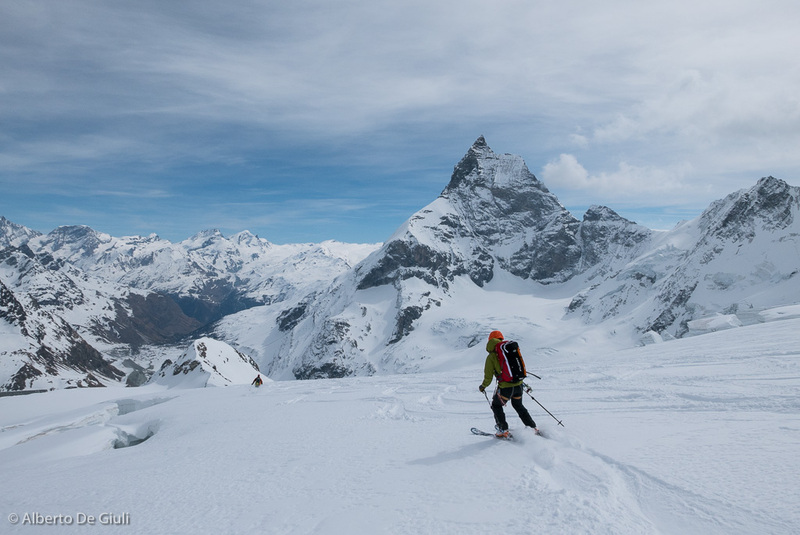 On top of Pigne d’Arolla, the Matterhorn is getting closer. 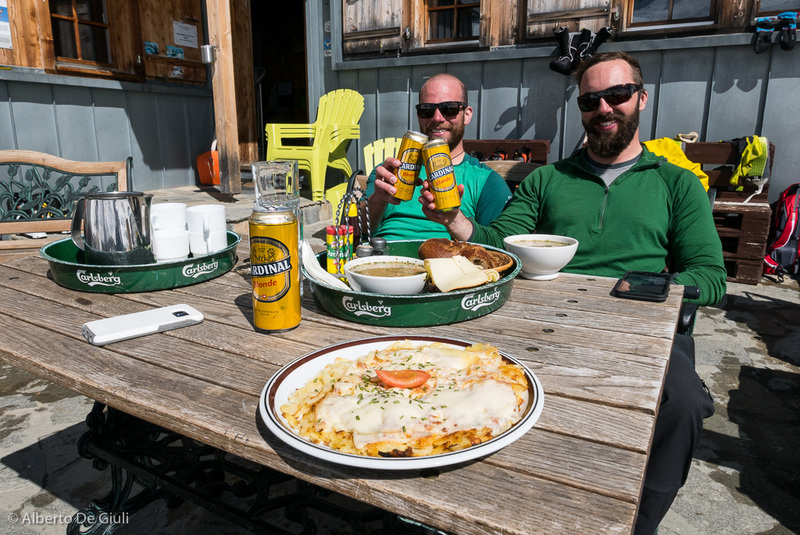 Haute Route Chamonix to Zermatt, day 5. 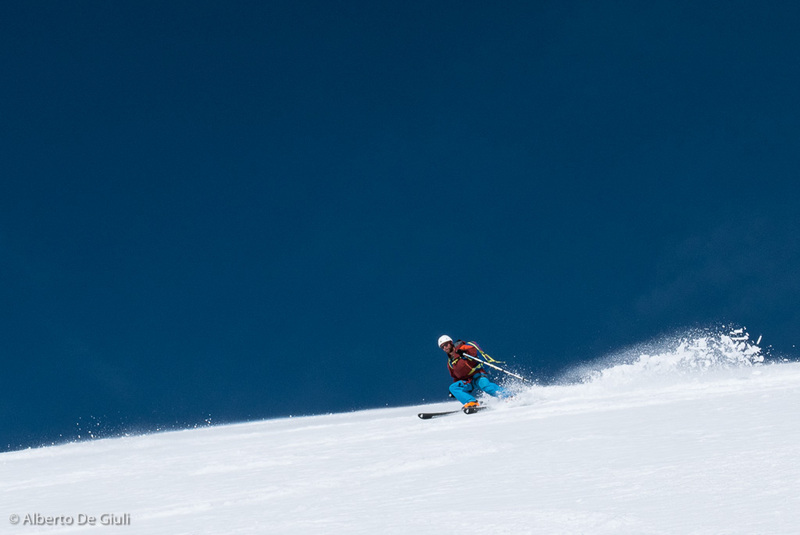 Ski down from the top of Pigne d’Arolla was really beautiful, we got some powder up and perfect corn all the way down to the Col de Charmotane. We had to put the skins back on for half hour to reach the Cabane des Vignettes, but that was definitely worth it. 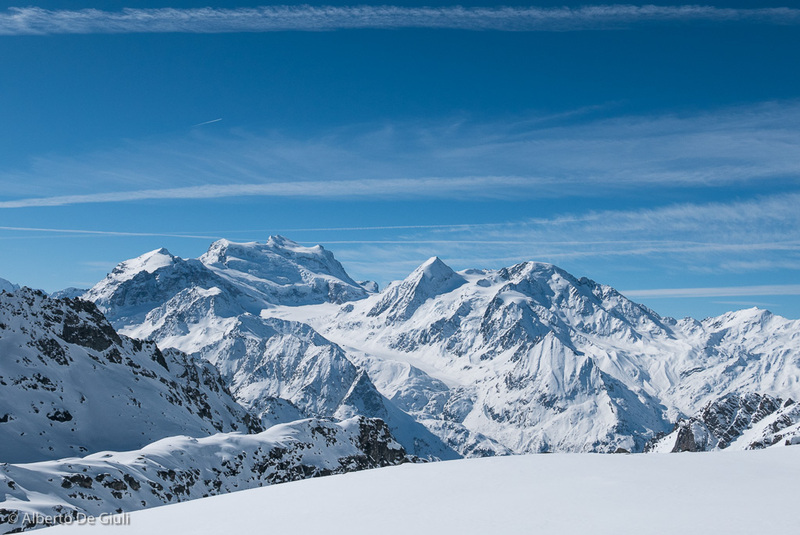 As soon as you reach the last Col de Valpelline, the icon of Matterhorn appears in front of your eyes. Haute Route Chamonix to Zermatt day 6. 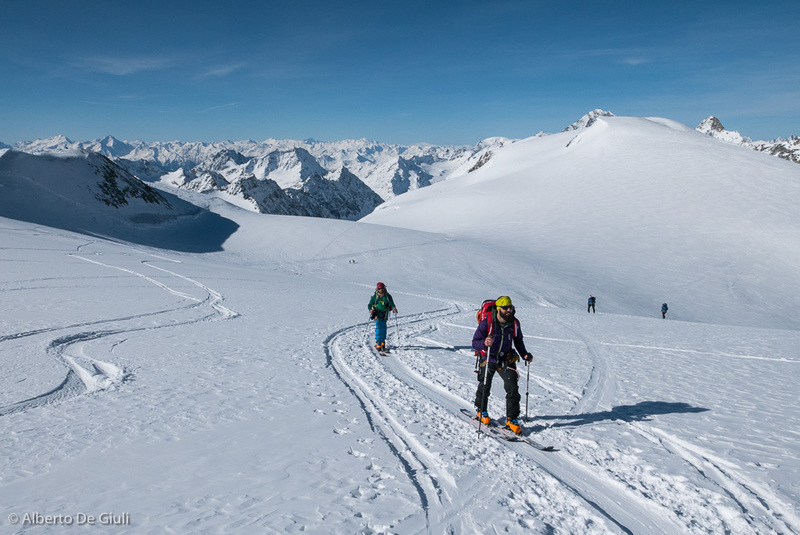 From the summit of the Tete de Valpelline it’s all downhill, skiing across the Stockjigletscher and Tiefmattenfgletscher and is one of the most exciting experiences you can live in the Alps, without being necessarily great skiers. 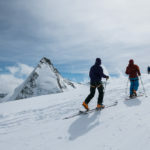 The descent to Zermatt never ends, when you get to Stafelalp the temptation to sit at the bar and enjoy a cold beer is very high, but we thought we better kept going, since before reaching the the ski slopes in Furi there are still some good spots where you need to side step up or do some skate skiing. 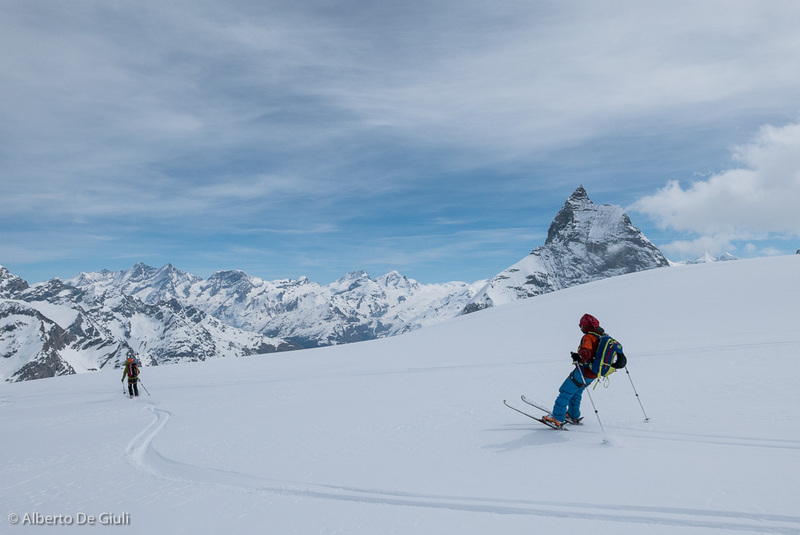 We finally got to Zermatt with skis on our feet, following the last shallow snow layer on the piste. 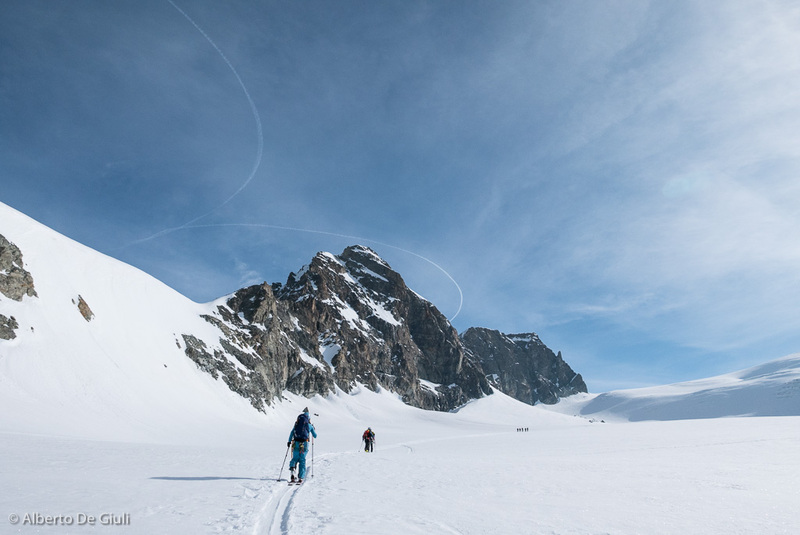 What else … all the images you find in the gallery are too many, but they are a great memory from an outstanding week around high mountains and absolutely perfect skiing. 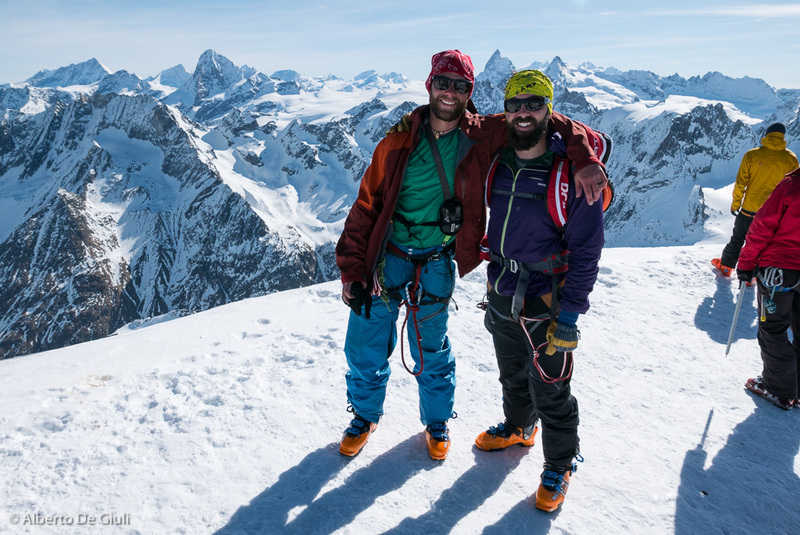 Thanks to my fella Auston and Andrew for sharing such a great adventure together. 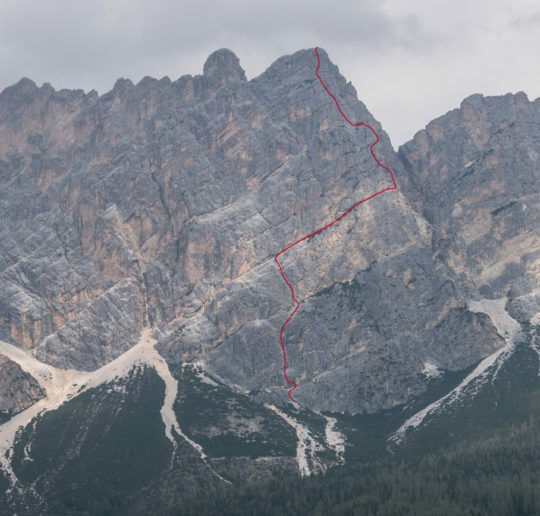 For those interested, here you can find the links to GPS tracks that I recorded with my Suunto Ambit3. 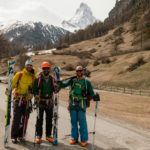 Haute Route Chamonix-Zermatt, day 1. 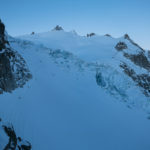 Glacier des Amethystes. 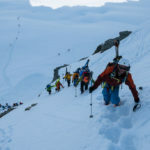 Haute Route Chamonix-Zermatt, day 2. 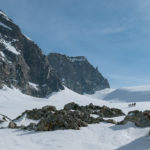 Refuge d’Argentière – Col du Chardonnet – Fenetre de Saleina – Cabane du Trient. 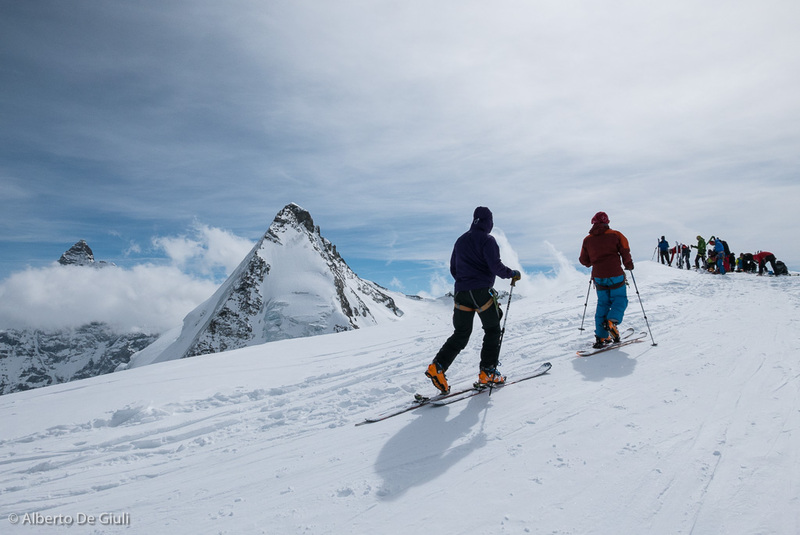 Haute Route Chamonix-Zermatt, day 3. 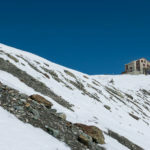 Cabane du Trient – Col des Ecandies – Champex – Verbier – Col des Gentianes – Col de la Chaux – Col du Momin – Rosablanche – Cabane Prafleuri. 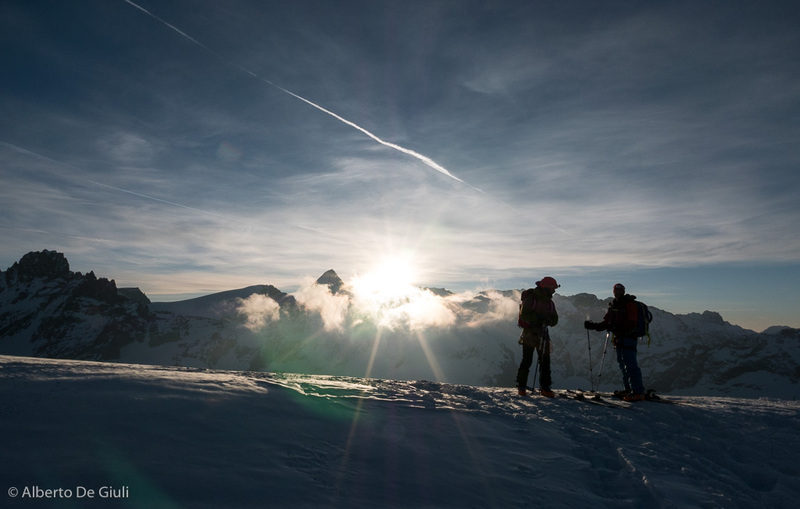 Haute Route Chamonix-Zermatt, day 5. 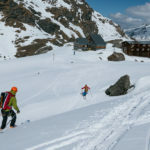 Cabane des Dix -Pigne d’Arolla – Cabane des Vignettes. 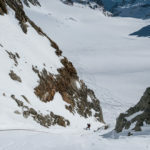 Haute Route Chamonix-Zermatt, day6 Cabane des Vignettes – Col de Charmotane – Col de l’Eveque – Col du Mont Brulée – Col de Valpelline – Tete de Valpelline – Stockjigletscher – Tiefmattengletscher – Stafelalp – Furi – Zermatt. 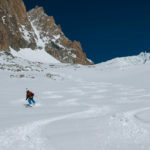 Good lap down the Basin d’Argentiere. 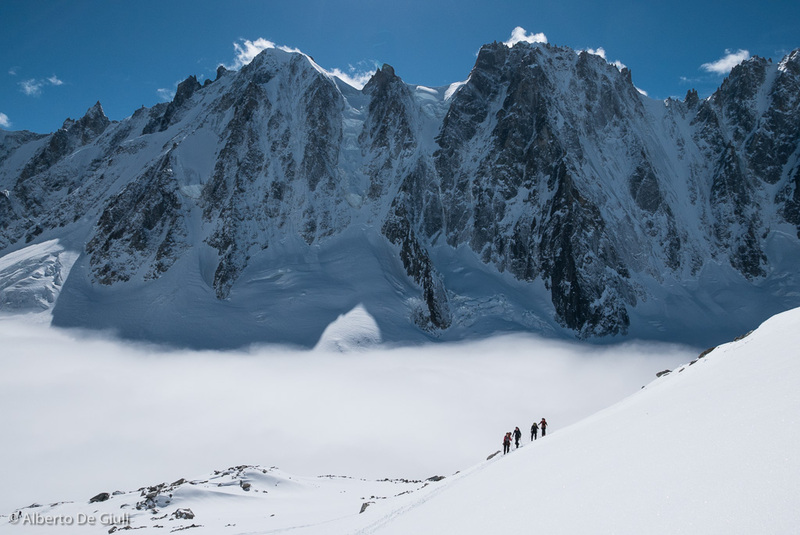 Haute Route day1. 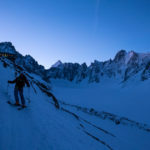 Setting off from Argentiere Hut, Haute Route Chamonix to Zermatt day2. 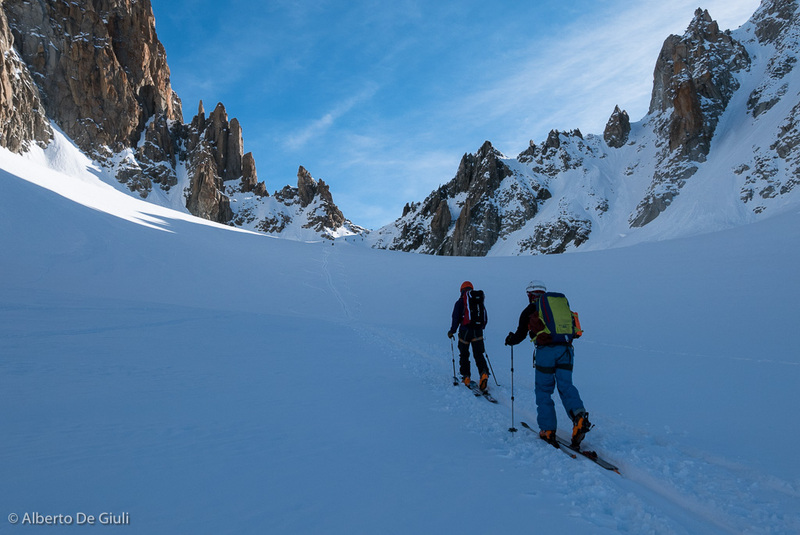 Skinning up to Col du Chardonnet. 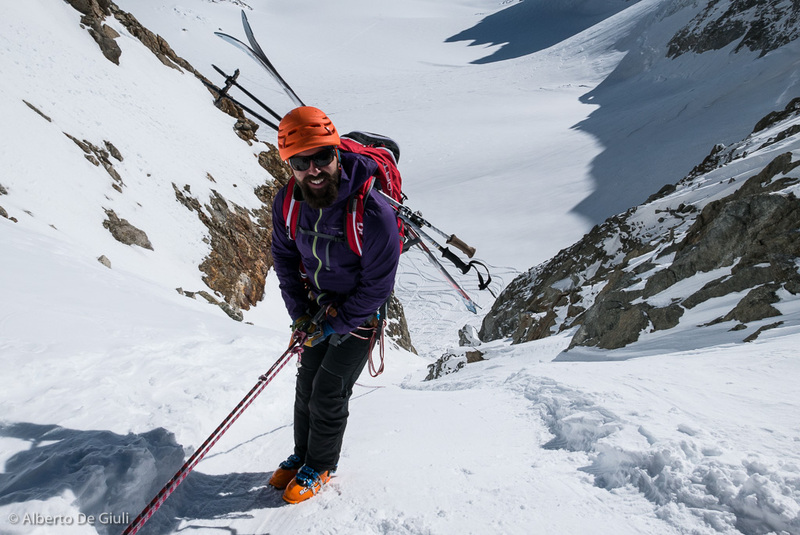 Haute Route Chamonix to Zermatt day2. 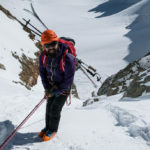 Rappelling from Col du Chardonnet down the Glacier du Saleina. 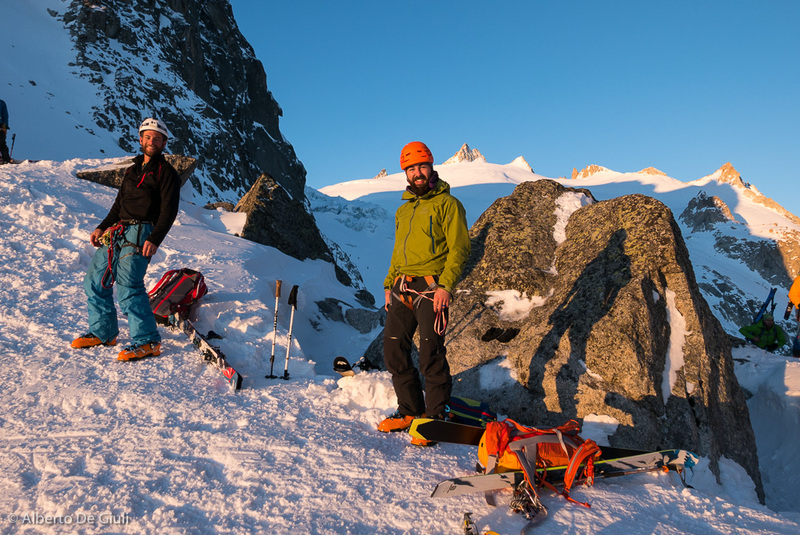 Haute Route Chamonix to Zermatt day2. 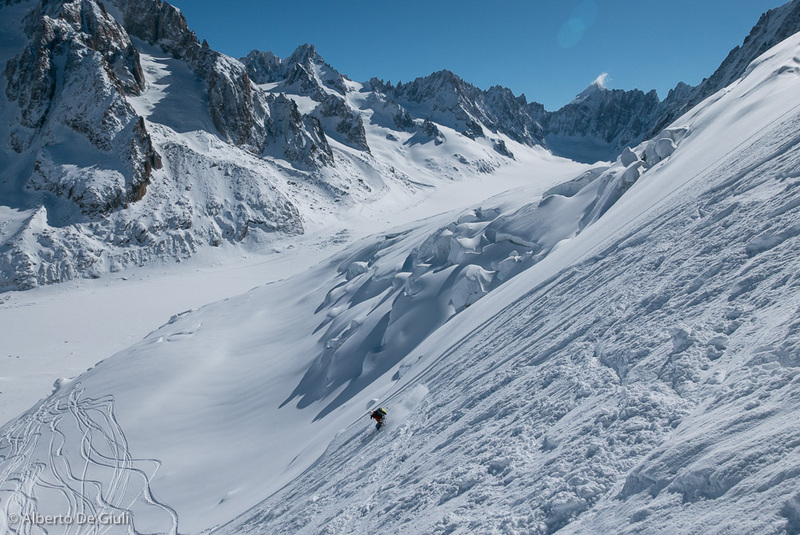 Good powder down the Glacier du Saleina. 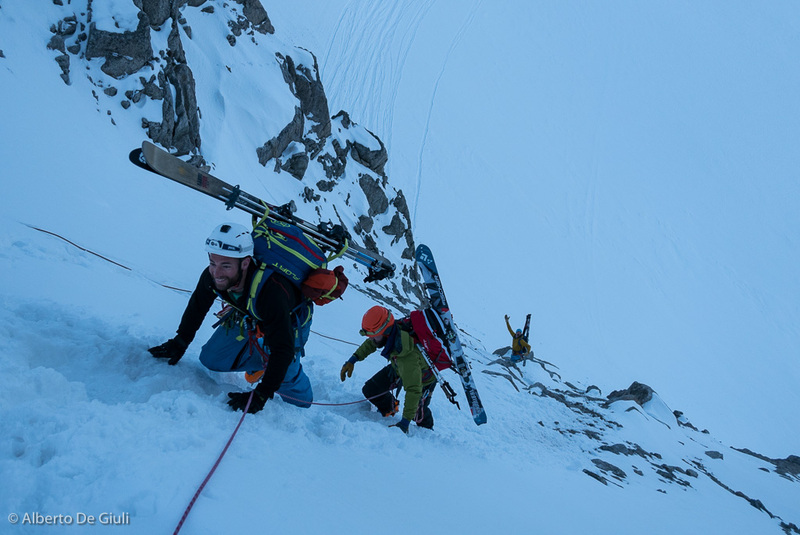 Haute Route Chamonix to Zermatt day2. 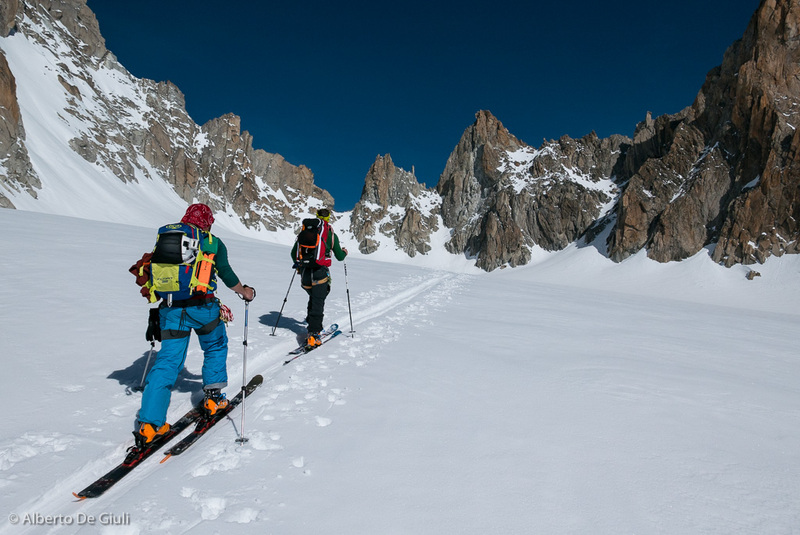 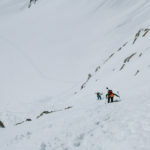 Skinning to the Fenetre de Saleina. 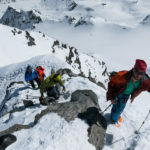 Haute Route Chamonix to Zermatt day2. 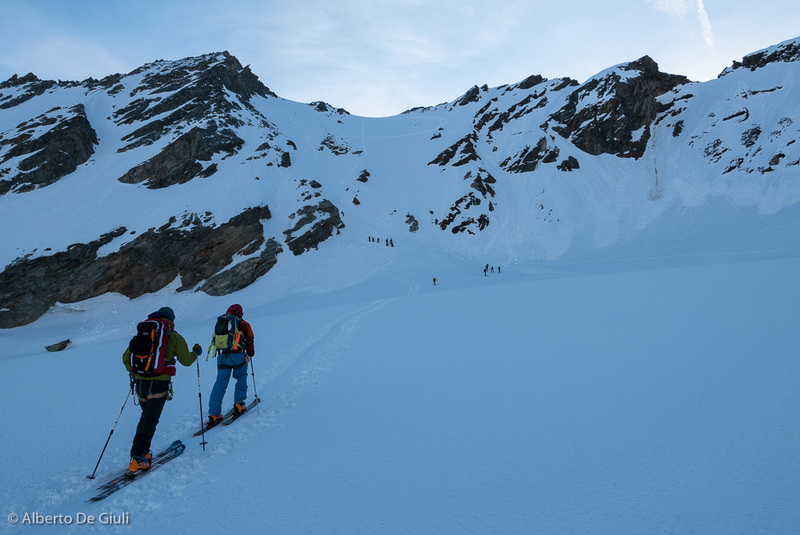 Boot packing up the steep slope to the Fenetre de Saleina. 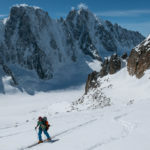 Haute Route Chamonix to Zermatt day2. 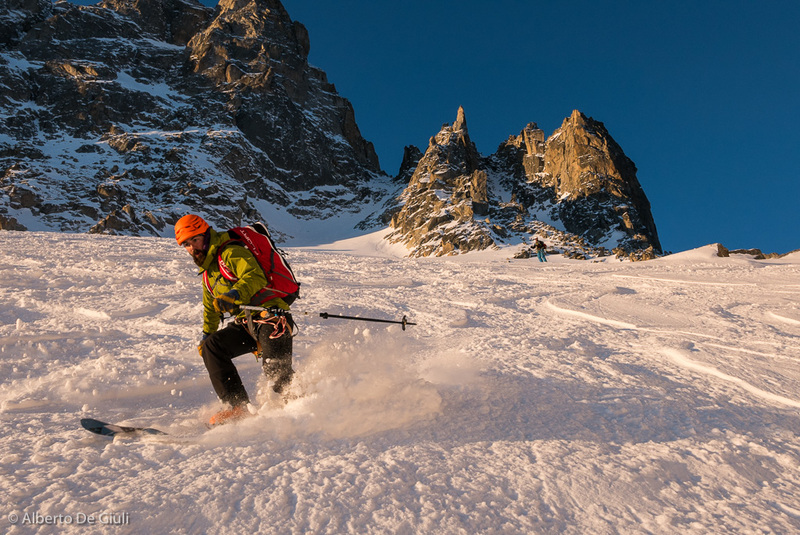 Last downhill of the day on the Plateau du Trient. 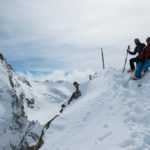 Haute Route Chamonix to Zermatt day2. 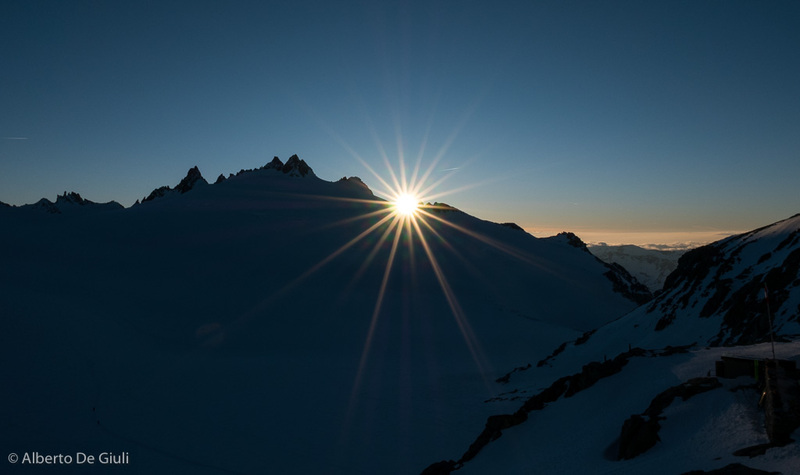 Sunset from the Cabane du Trient. 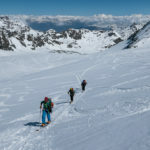 Haute Route Chamonix to Zermatt, day2. 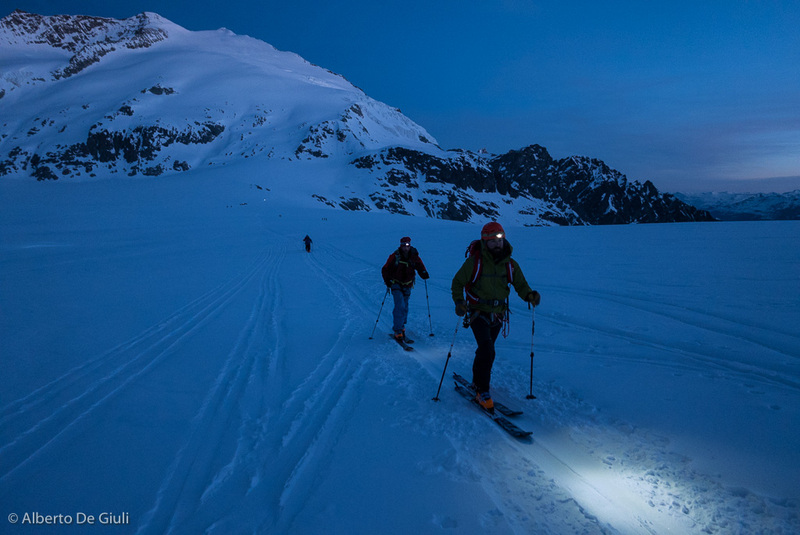 Headtorches on, we skied down the Glacier du Trient on day3. 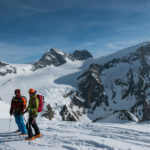 Haute Route Chamonix to Zermatt. 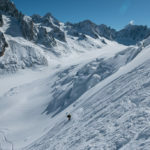 Climbing the steep section to Col des Ecandies. 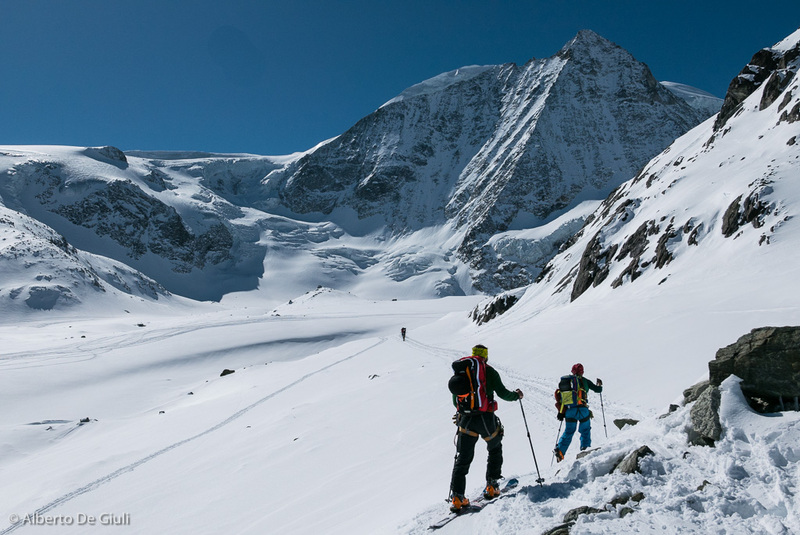 Haute Route Chamonix to Zermatt, day3. 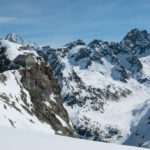 Col des Ecandies. 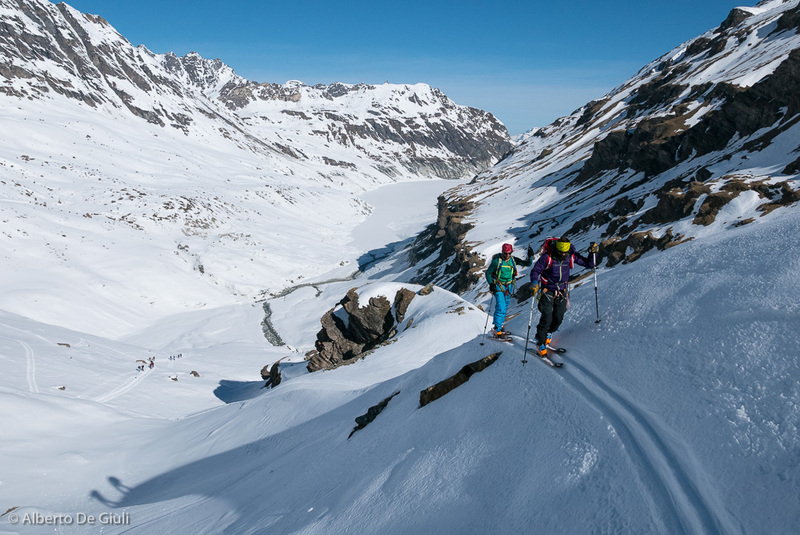 Haute Route Chamonix to Zermatt, day3. 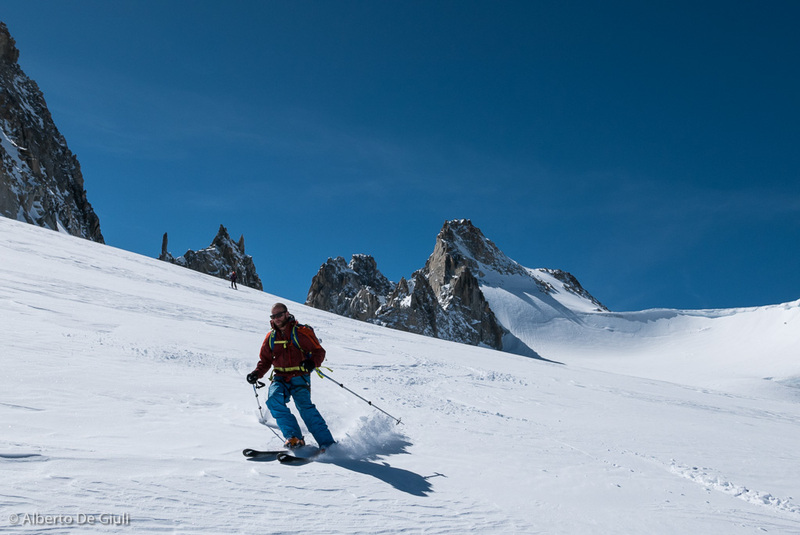 Val d’Arpette. 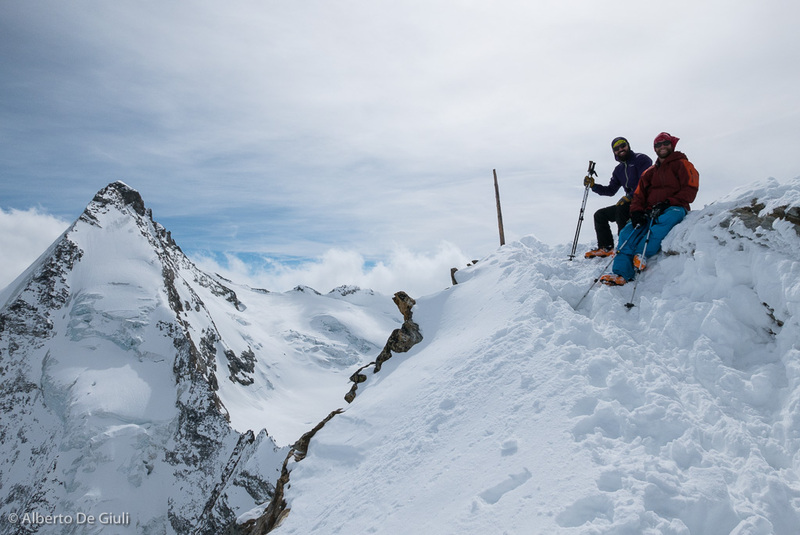 Haute Route Chamonix to Zermatt, day3. 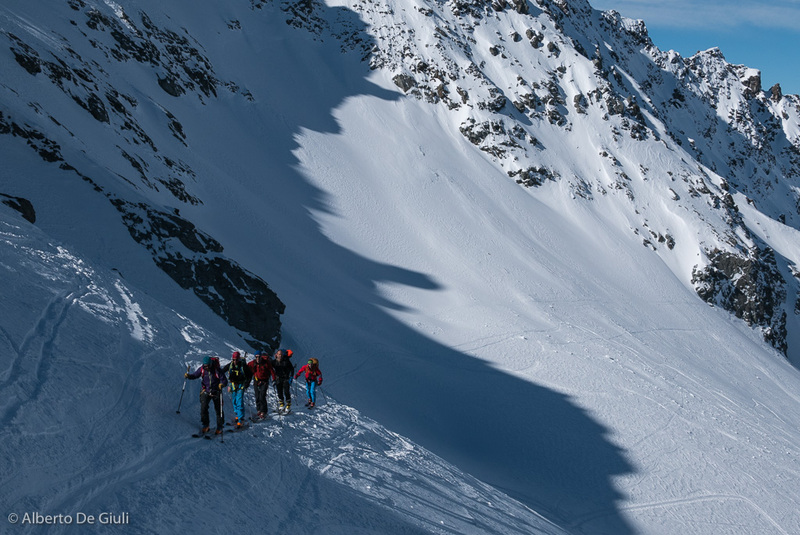 Skinning up to Col de la Chaux, Verbier. 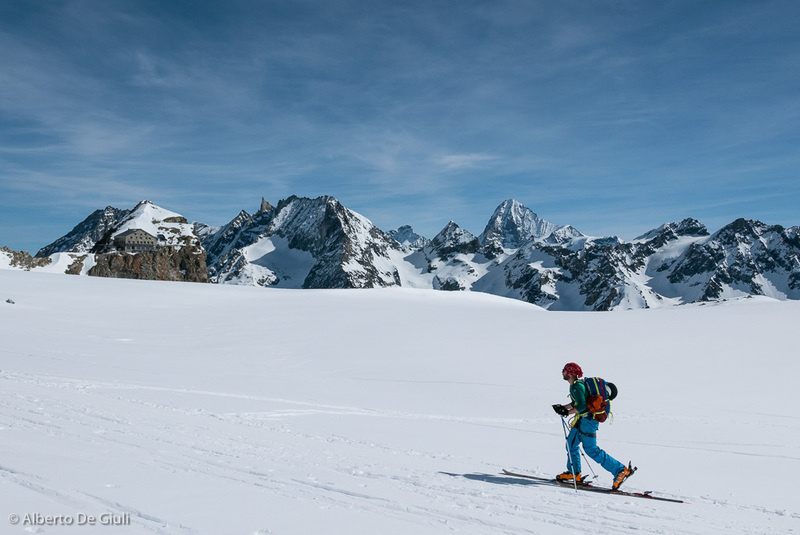 Haute Route Chamonix to Zermatt, day3. 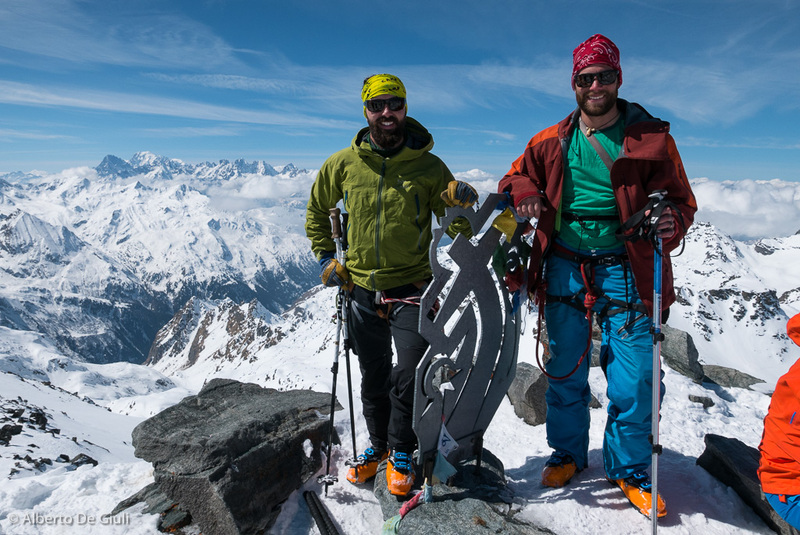 Looking at the Gran Combin, Haute Route Chamonix to Zermatt, day3. 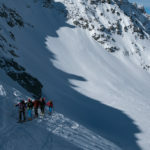 Skinning to Col de Momin, Verbier. 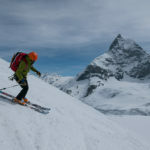 Haute Route Chamonix to Zermatt, day3. 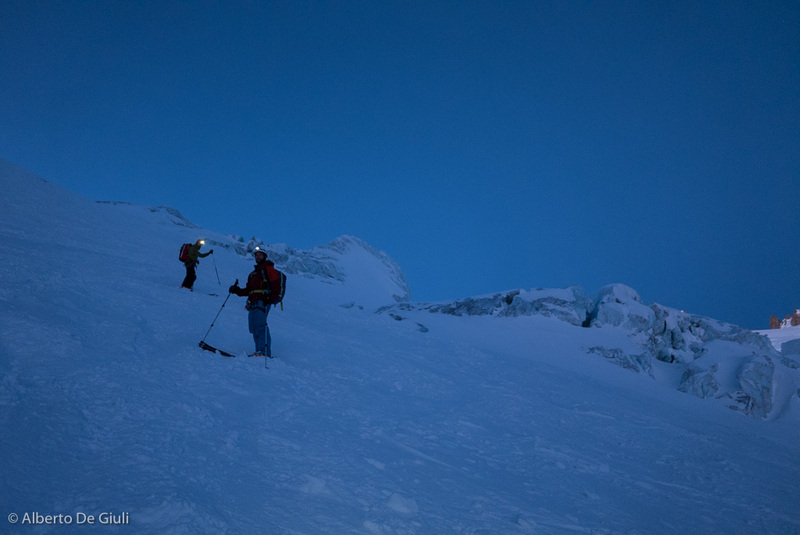 Last kick turns under the summit of Rosablanche. 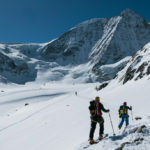 Haute Route Chamonix to Zermatt, day3. 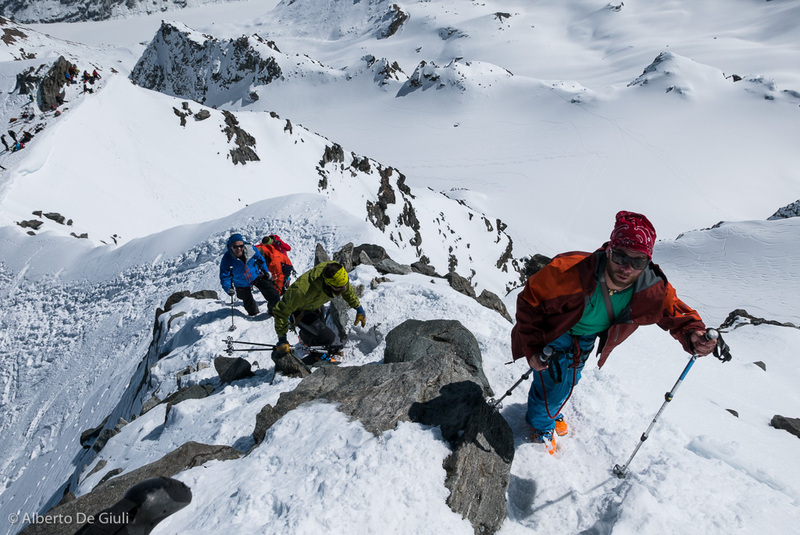 Steep and exposed boot pack on the last meters to Rosablanche, Verbier. 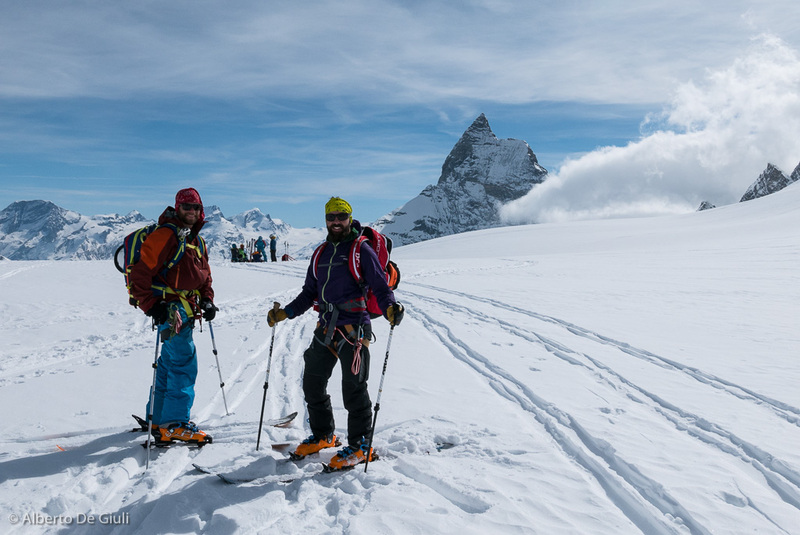 Haute Route Chamonix to Zermatt day3. 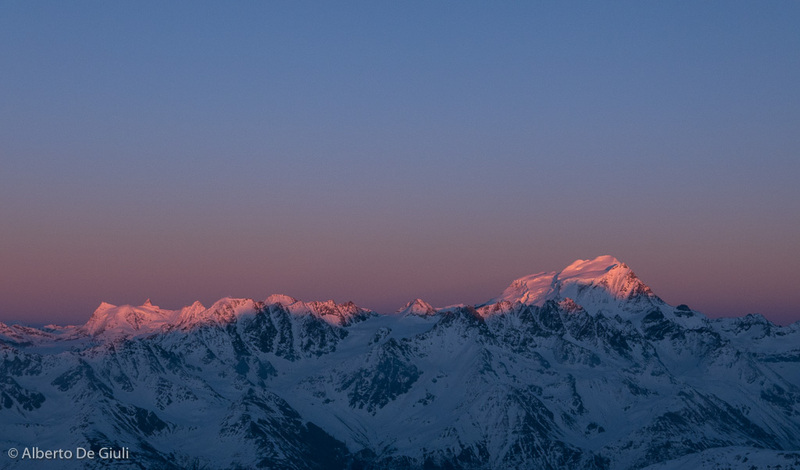 Rosablanche, Verbier. 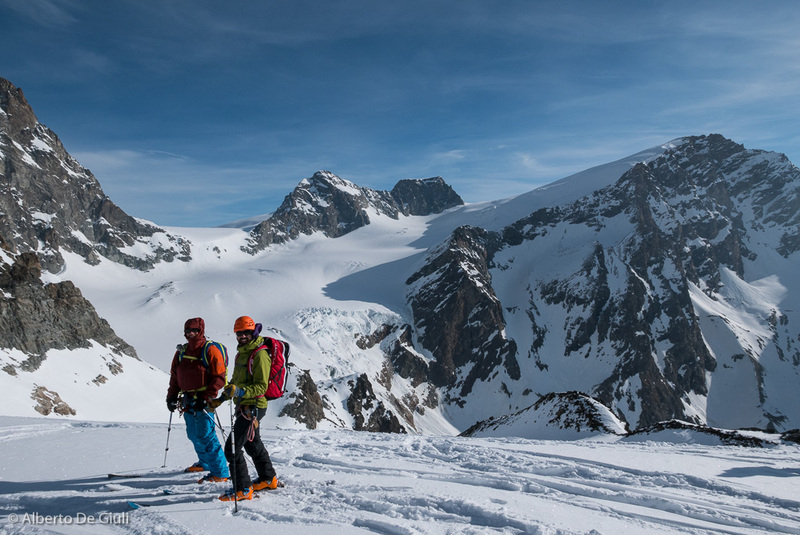 Haute Route Chamonix to Zermatt day3. 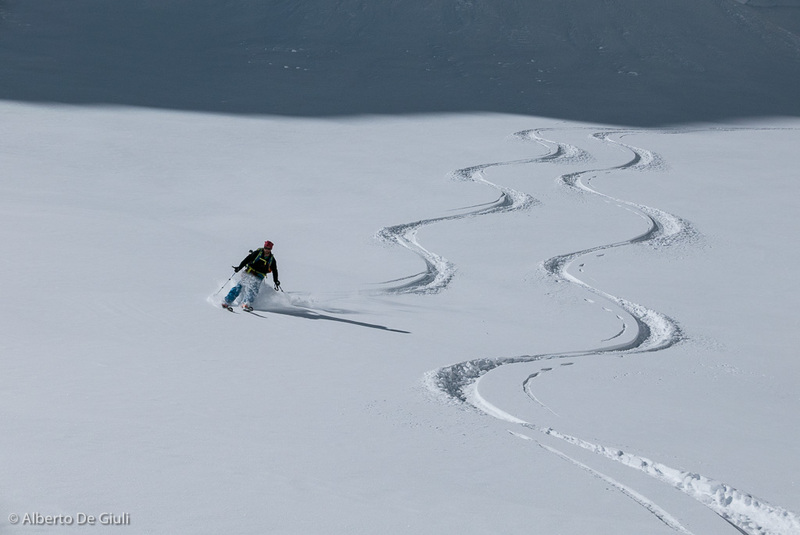 Good powder down Rosablanche, Verbier. 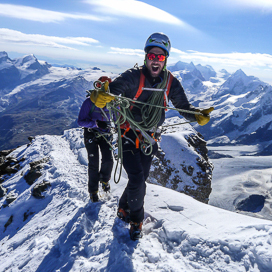 Haute Route Chamonix to Zermatt day3. 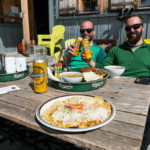 At the Prafleuri Hut, Haute Route Chamonix to Zermatt day3. 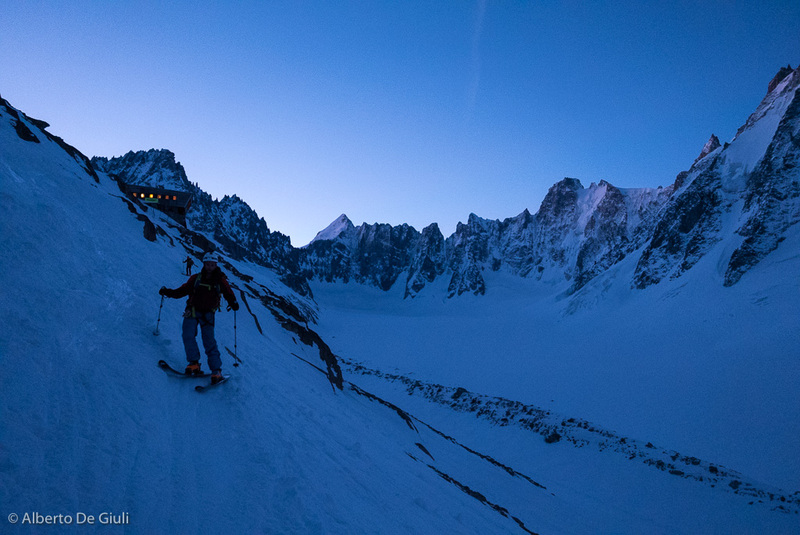 Leaving the Prafleuri Hut at the first lights, Haute Route Chamonix to Zermatt day4. 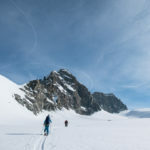 Across the Lac de Dix, Haute Route Chamonix to Zermatt day4. 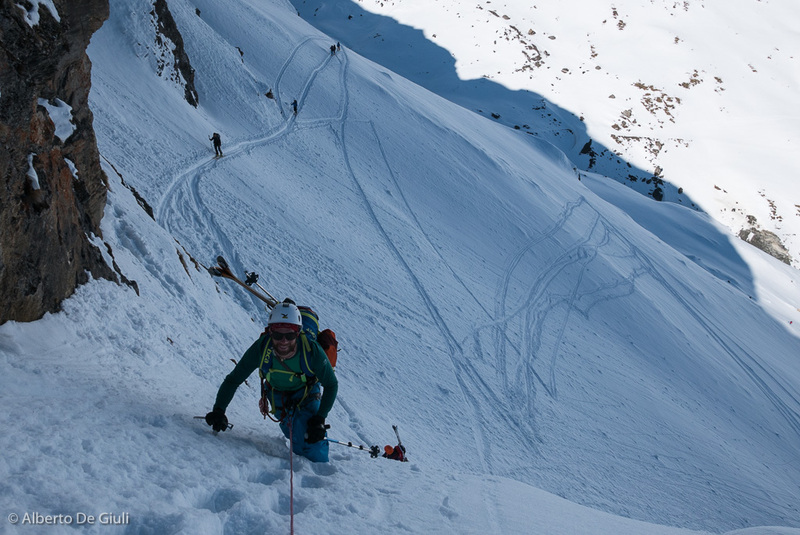 A steep section above the Pas du Chat, Haute Route Chamonix to Zermatt day4. 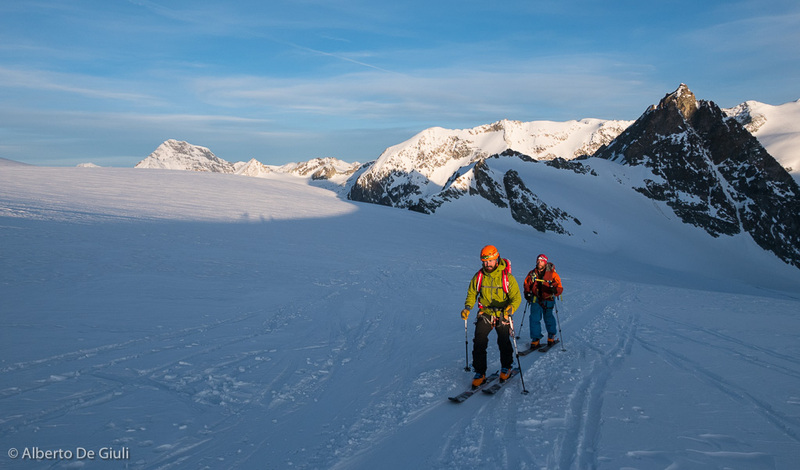 Skinning to Cabane des Dix, Haute Route Chamonix to Zermatt day4. 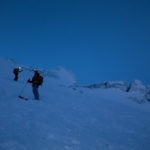 Day 5 of the Haute Route Chamonix to Zermatt. 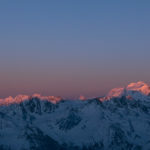 Mont Blanc de Cheillon. 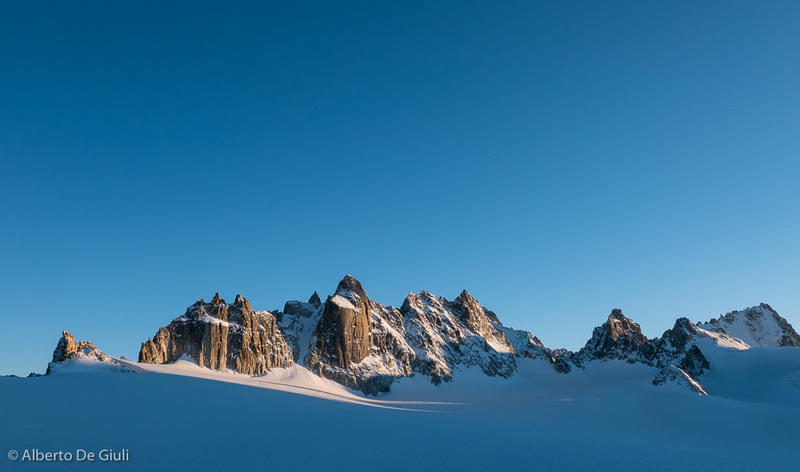 Col de la Serpentine and Pigne d’Arolla, Haute Route Chamonix to Zermatt day5. 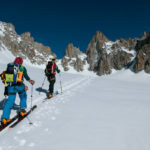 Skinning to the top of Pigne d’Arolla, Haute Route Chamonix to Zermatt day5. 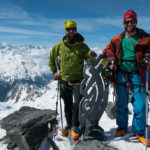 Top of Pigne d’Arolla, Haute Route Chamonix to Zermatt day5. 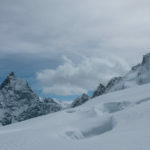 Good snow down Pigne d’Arolla, Haute Route Chamonix to Zermatt day5. 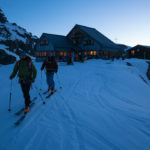 Getting to our last hut of the trip, the Cabane des Vignettes. Haute Route Chamonix to Zermatt day5. 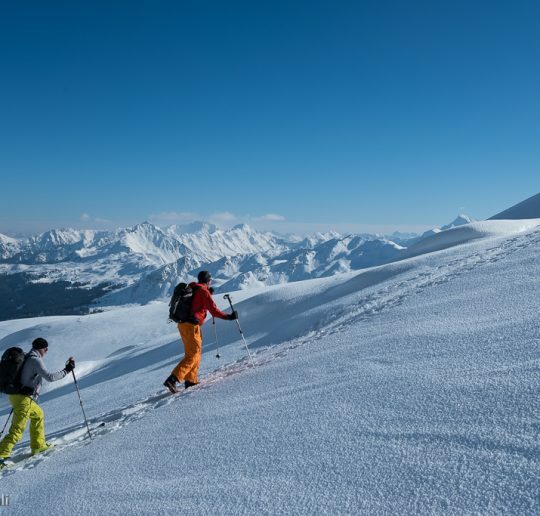 Skinning towards the first col of the day, Col de l’Eveque. 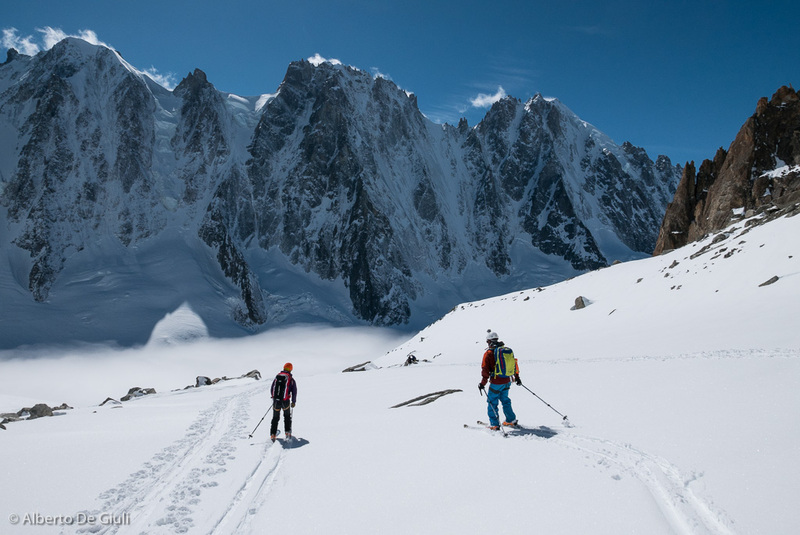 Haute Route Chamonix to Zermatt day6. 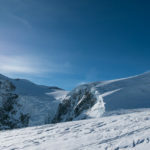 Col de l’Eveque. 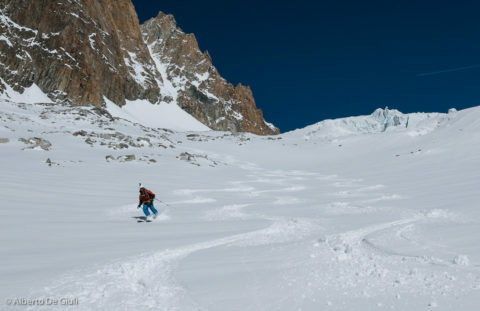 Haute Route Chamonix to Zermatt day6. 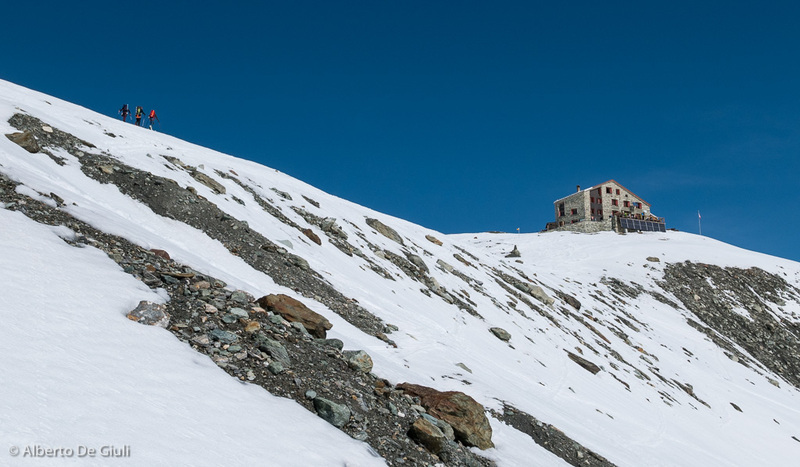 Col du Mont Brulée, Haute Route Chamonix to Zermatt day6. 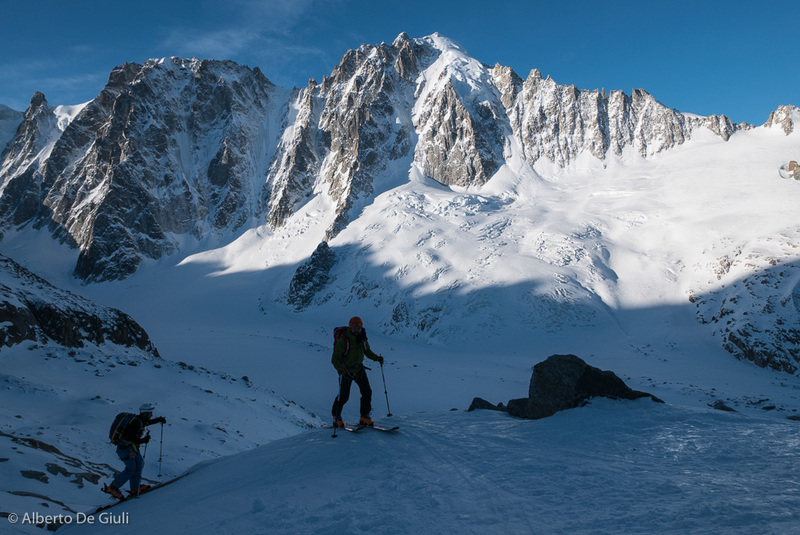 Towards the Col de Valpelline, Haute Route Chamonix to Zermatt day6. 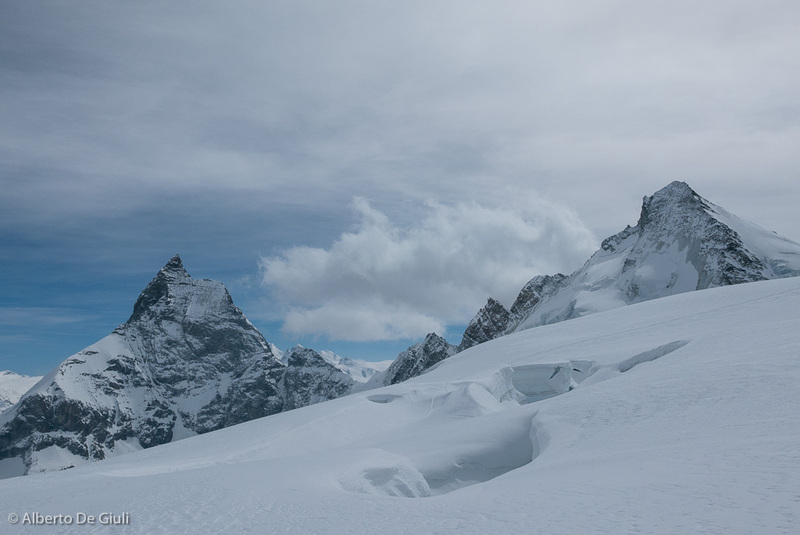 The Matterhorn comes out only when you get to the Col de Valpelline. 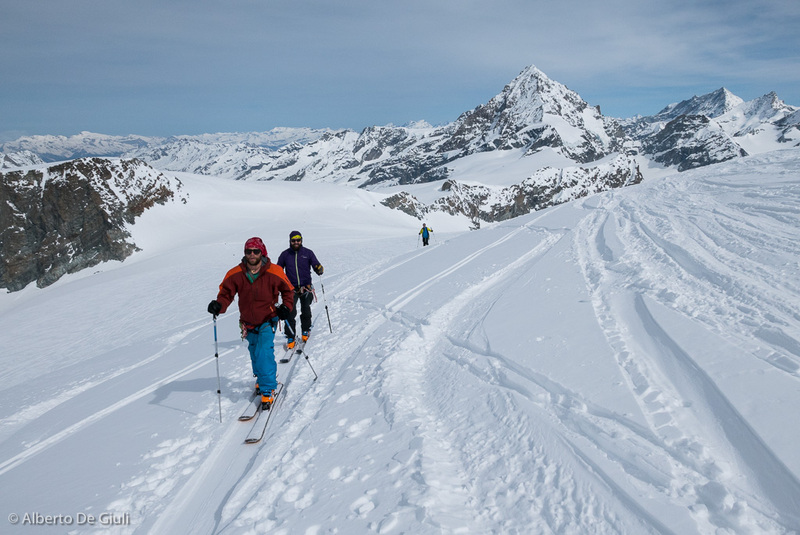 Haute Route Chamonix to Zermatt day6. 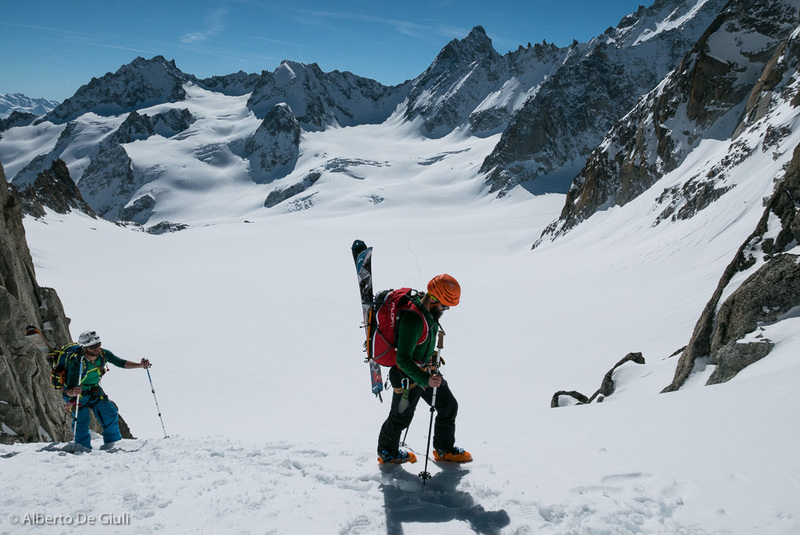 Skinning to the top of Tete de Valpelline, Haute Route Chamonix to Zermatt day6. 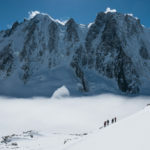 Tete de Valpelline, Haute Route Chamonix to Zermatt day6. 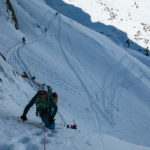 The endless last way down just started. 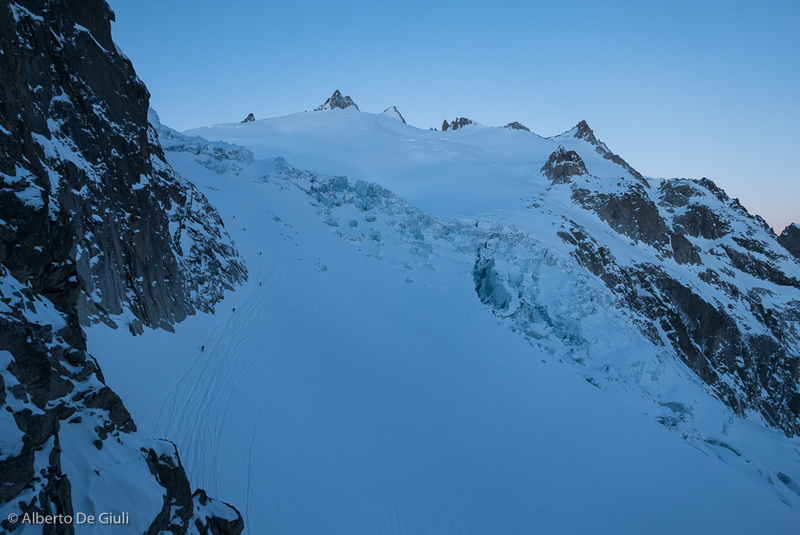 Tete de Valpelline, Haute Route Chamonix to Zermatt day6. 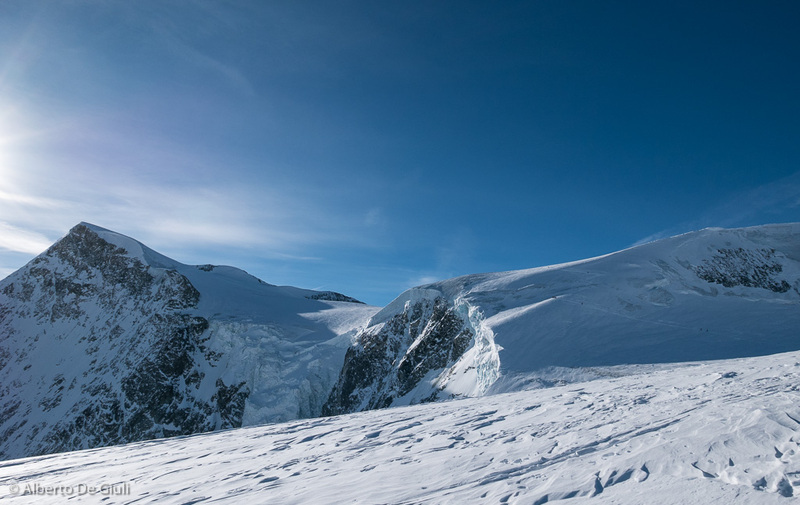 The Matterhorn and Dent d’Herens while skiing down the Stockjigletscher.Haute Route Chamonix to Zermatt day6. 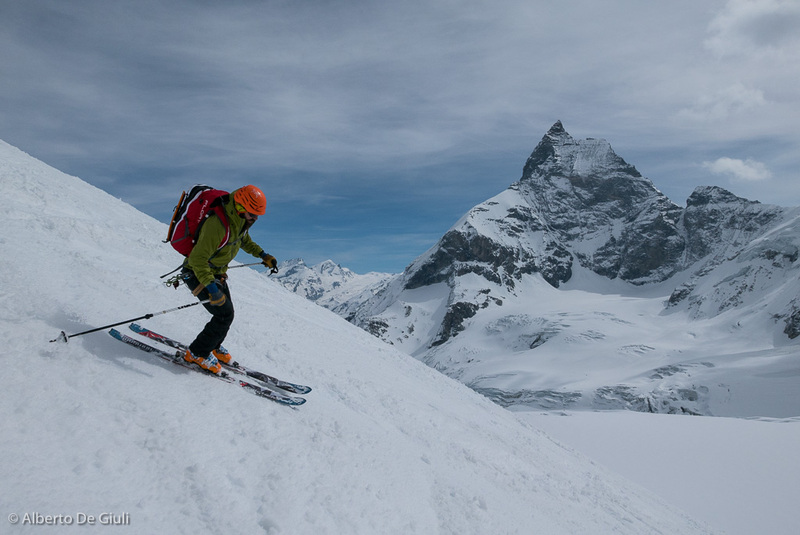 The Matterhorn while skiing down the Stockjigletscher.Haute Route Chamonix to Zermatt day6. 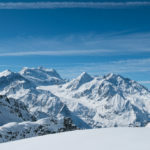 Zermatt, here we are! 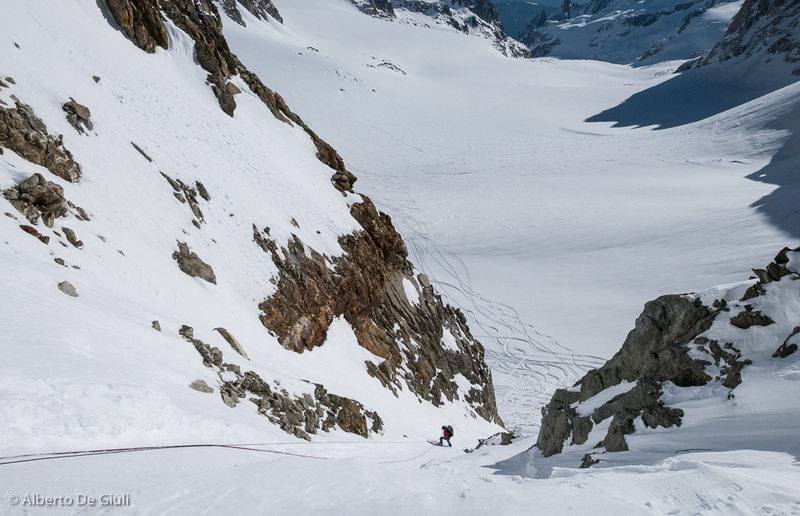 Haute Route Chamonix to Zermatt day6.